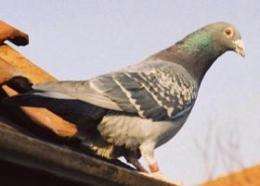 (PhysOrg.com) -- In South Africa, a carrier pigeon carrying a 4GB memory stick proved to be faster than the ADSL service from the country's biggest web firm, Telkom. Winston the pigeon took one hour and eight minutes to carry the data across the 60-mile course, and it took another hour to upload the data. During the same time, the ADSL had sent just 4% of the data. The race was held by an IT company in Durban, South Africa, called Unlimited IT. One of Unlimited IT's employees complained about the slow speed of data transmission on ADSL, saying that data would get transferred faster by carrier pigeon. To highlight just how slow the broadband internet is, the company decided to test that claim. The 11-month-old Winston flew 60 miles from Unlimited IT's call center in Howick to another office in Durban. To make sure that the bird didn't have an unfair advantage, Unlimited IT imposed some rules on its website, including "no cats allowed" and "birdseed must not have any performance-enhancing seeds within." Hundreds of South Africans followed the race on social networking sites Facebook and Twitter. For its part, Telkom said that it was not responsible for Unlimited IT's slow broadband speeds. A Telkom spokesperson said that they had made several recommendations to Unlimited IT to improve its service, but none of the suggestions had been accepted. As the BBC reports, South Africa is one of the countries that could benefit from three new fiber optic cables being laid around the African continent to improve internet service. and it highlights the internet gap in poorer countries. We use the internet to share and gather information other large quantities -- people and business in these countries have an unfair block to the same resource that allows more industrialized nations and continents to be competitive. It is on the individual nation however to fix this problem for their people. Actually many third world countries have excellent cellphone networks because the cost of wiring a country is much more expensive than putting in a good cellphone network! Just try claiming in the workplace that it's cheaper and faster sometimes to hand someone a piece of paper...or that paper stores far longer than computer media...or that using PowerPoint doubles the time it takes to create a presentation. Or try telling someone that the new incredibly-expensive-to-remix Beatles albums are now, finally, better than the original British vinyl (after 20 years of CD). It's heresy. Technology is always better. Even if it really isn't better. Even if there's just an expectation that someday it will be better. Might be better. Righteously, *should* be better. Where's my non-digital drink and Thai beef salad? Hmm, the condition in Malaysia would not be far off, I will have downloaded 18-22.5% here, slightly better however. And that's the speed of local file transfer using the common broadband package.